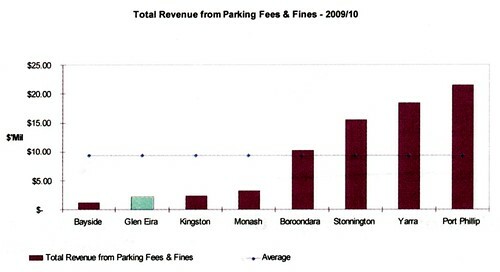 I assume Glen Eira council put this graph of forecast revenue from parking in their propaganda sheet newsletter because they’re pleased about it. I was going to point out that plenty of people park in stupid places, and I’d prefer they got stung with tickets if at all possible, so they can subsidise my council rates. It looks to me like every other council nearby except Bayside is doing a better job at this than mine. But having thought about it, I suppose some of those inner-city councils are also earning a heap of money off parking meters. I’m not sure there are many spots in Glen Eira that would be worthy of parking meters. I’m not adverse to paying for parking in high demand areas, if it’s relatively cheap, and particularly if there are easy ways to get there without a car, but I suspect in most areas of Glen Eira it would just encourage a lot of shoppers to go elsewhere. Next → Next post: How crowded is your line? The only reason Monash ranks so low with its revenue from parking fines is because everytime residents ring to complain about cars double parked up and down our street, across and actually IN people’s driveways we get the “We don’t have any parking officers free to inspect this issue” script. I had one lass state they only employed 8! We keep telling ’em they’d earn enough dosh to employ a bajillion more officers if they’d just start fining the cars in our street…! I am very pleased to see Port Phillip top the list. The big shopping centres should be forced to charge for parking and then the councils could charge for parking in the street and council car parks near shops so people would be have to pay more than the petrol if they wanted to drive to the shops. Parking permits would also be a source of revenue from parking in the inner city. Working in Glen Waverley literally on top of the Monash City Council, we find the exact opposite is true. The Parking Officers are absolute Nazi’s, many people in our office have received $60 fines 1-5mins over the allotted time!!! We walk out of our office to get a coffee and spot 3 Parking officers scouring the car park eager for victims to persecute and penalise! With no All day parking spots available (only 1.5 hour and 4 hour), the poor office workers who pump thousands of dollars into the local community receive a lovely fine for the lovely privilege of coming to work if a meeting or phone call goes over by a few minutes. The only other resort we have is to park 5-10 minutes walk away in the local suburban streets. With a 100 other people doing the same, parking spots become thin picking. Some people obviously lack spatial parking awareness and block a two bay parking spot with their single car… in desperation, with nothing else available, we park as close as we can. I’ve received a fine for intruding a mere 50mm over someone’s driveway… PLENTY of room to go around. Yet I had literally no where else to go. Jayne, I’ll gladly give you the $240.00 in fines I’ve received this year if you let me park in your driveway… problem solved!! There are a few areas of paid ticket parking in Glen Eira around Monash Uni Caulfield, a relatively reasonable $4.50 all day, compared to the $15 or so for all day parking in the 6 level megaparkingplex on campus.